I chose this story just because it is short and easier to translate...it gives you an idea of the kind of narrative I have with these interviews...if you have comments please do not hesitate...does it touch you? do you think people would be touched to hear their stories...just simple like this (this is exactly the way it was told) or should I re-write them with commments ??? My name is Traan Tho Quit . 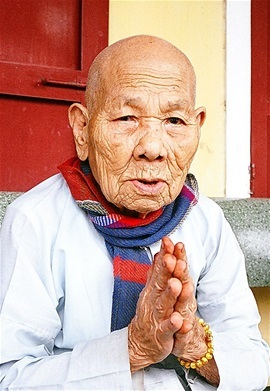 I was born in 1918 in An Cuu, a village near the ocean in the outskirts of Hue City. Unfortunately my mother passed away very early in life. She joined our ancestors when I was only 10 years old. Our father had to bring up 3 girls on his own. My elder sister drowned, carried away by the water. I only found out she had died once she was already buried. I have no news of my younger sister since very long time. After my mother passed away, my father brought us to a village in the hilltribe region, to live there. We cultivated potatoes and cassava. We did not have a house of our own, we stayed in some other people’s home. When these people lost their house, we had no more roof above our heads. The sky became our roof and the earth our floor. What hardship! You cannot image ! My father had a handicaped leg, that’s why he could not work well. Since very long time he suffered from pustules. As he was not treated properly the infection reached his bones. In the end his leg had to be amputated. One year after we moved to the hilltribe area, my father passed away at the age of 62. I myself had a family of my own. I had 3 children, 2 girls and 1 boy. I had them but yet I did not have them, they all died. My husband burried them all.The first one a girl, died at birth. My husband burried her. The second, a boy went back to « paradise » after only one month on earth. The youngest a girl at around 3-4 years died of pneumonia.It was during the war, we had no medicines. When she got sick and got worse and worse I cried for help. She was brought to hospital, but after 4 days she passed away. My husband also died, so there is only me left. The war with the french was soon over, but the war against the americans seemed endless. When the war against the french started we were already in the hilltribe area. We had to leave our hamlet in one night. When the french arrived near our hamlet we were terribly scared. We were scared to be interrogated and to be falsely accused, but luckily we managed to flee before they arrived.The whole hamlet fled. But the american war lasted many years. We had to go on the fields early in the morning in order to be finished with our work by 10 o clock. We then had to hide from the bombs. Life was so hard. When we had to evacuate our hamlet, we could not carry anything with us, except the little children in baskets carried on our backs. Sometimes we met some Bo Dois (soldiers of the north army) and they shares their rice with us. It was such a hard life ! When life became more peaceful, I was happy to return to my native village.But alas, there was no one left alive from my family. In 1983, I followed a merchant to Hue City. I built myself a little straw roof as a little shelter near the Tinh Duc Pagoda. I took up any work I could find in order to survive. After 2 years Sister Dieu Tanh saw me there living in this miserable hut. She offered me to live in her hospice. It will soon be 11 years that I live here in this hospice. Now I live here with no wories of a leaking roof, a wall that might fall on me*, no hunger, no thurst ! Before I lived from about one mesure of rice a day (equivalent the content of a condense milk box about 380g) 10 days, 10 mesures of rice, one year 365 mesures of rice ! If you calculate this would be it, but I rarely had 365 mesures a year during my whole life ! Here I have no more worries! no more worries not to have enough food ! And I am so happy to still have things to do, to help with different things. My only worry is to do them well. C est trop touchant.rien a ajouter.le temoignage suffit.